The good weather arrived yesterday - gloriously sunny for the most part and warm. It was fantastic as far as personal comfort was concerned but good weather doesn't mean good news for seeing spring migrants – and Wheatears in particular. I've yet to see one so far this year. 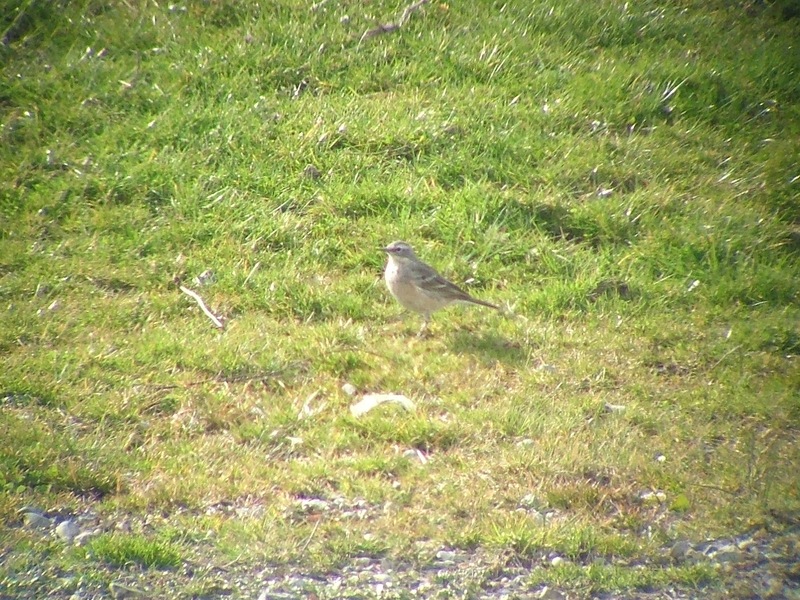 My local patch at Holmethorpe has been Wheatear-less, but Beddington – naturally – had loads a few days ago. 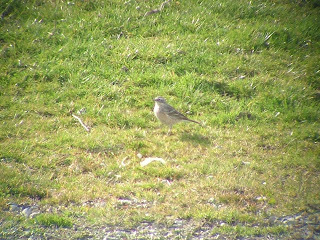 Canons Farm has also had one. Fine weather means migrants that are heading further north, such as Wheatears, are less likely to stop off somewhere en route to refuel. Bad weather means the birds have to work harder to get to their destination, so a rest break is more likely. The weather is looking good for the sun tan for the next few days, so finding a Wheatear is going to be harder. Still, that doesn't mean I'm not prepared to look. But first things first. 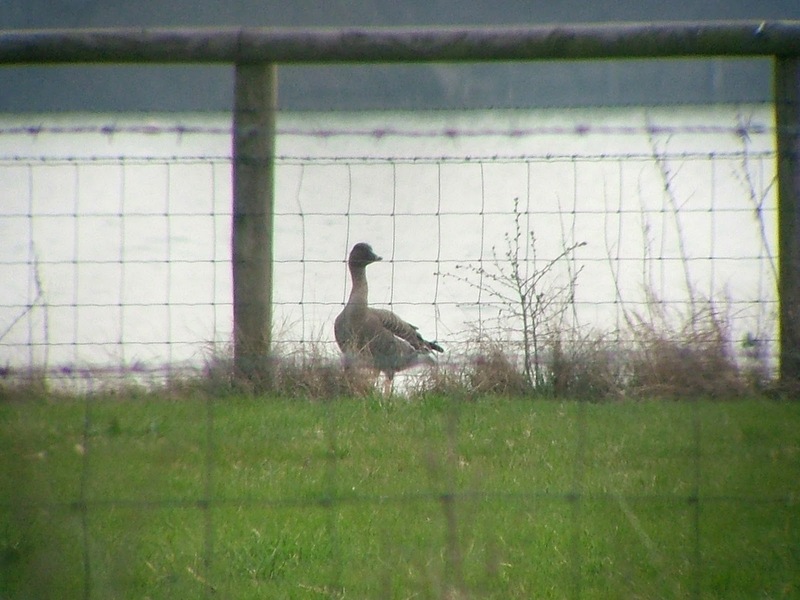 After a quick scan of the Surrey Birders website on Tuesday evening I discovered Kev Duncan, who patrols Thorpe, Chobham Common and Tice's Meadow, had seen the Tundra Bean Goose again in a small field on the west side of Manor Lake. 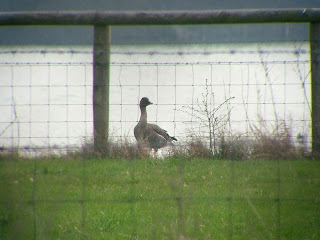 I dipped this goose twice when it was first seen at the beginning of February and after an initial flurry of news it all went quiet – until Tuesday. 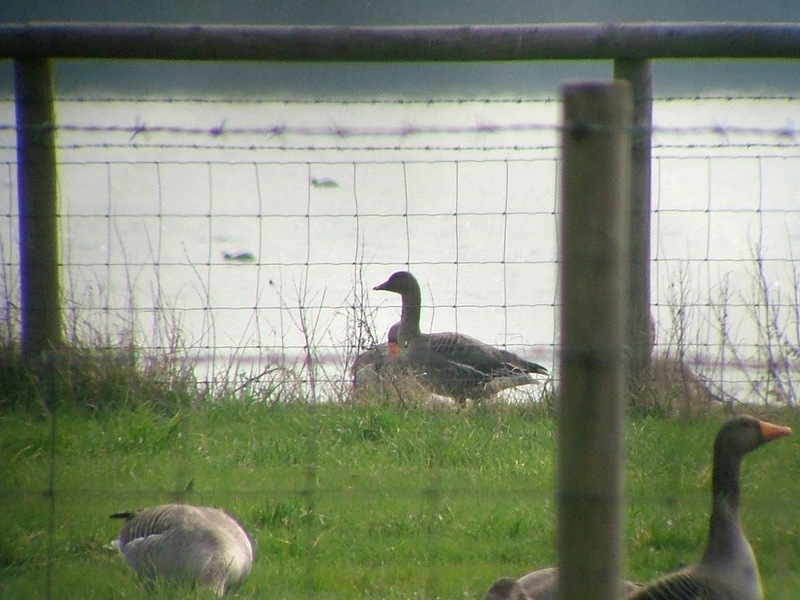 So, the next morning I kept a close eye on the online reports and the good news was the Tundra Bean Goose was still viewable in the area reported the evening before. It seemed rude not to have a third attempt to see this bird, so I set off mid-morning for Coldharbour Lane, near Thorpe. I was pleased to see that the Greylag Geese were still mulling around on the bank of the lake when I got there. Geoff Barter arrived shortly after me, and after a quick scan of the 20-odd geese we found the Tundra Bean Goose (108). What a relief. I didn't expect to see this bird after the previous two tries so it was great to find it more than a month later. With that fine tick in the bag, there was plenty of time to find a few more. With Wheatears thin on the ground at home I headed for Staines. The Reservoir was a bit of a let down. The Shag was in residence, there were plenty of Goldeneye swimming about, a couple of Redshank (109) to add to the year list but not much else – not what I could see at any rate. No Wheatears, for one thing. The reservoir is having a spring clean at the moment, with all the banking being cleared of vegetation – which is a shame as it has altered the habitat and probably means the Wheatears will go elsewhere. Next stop Staines Moor – I haven't been here for quite a few months so it was worth a look. If a Wheatear was going to crop up anywhere it would be on the Moor. But no. Loads of Skylark, Reed Bunting and Mipits but no Wheatears. 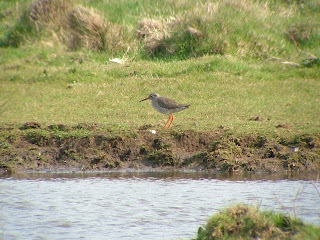 There were a couple of Redshank I got up quite close to, and best of all a really nice Water Pipit feeding on the edge of the river. It was on the walk back towards the boardwalk that I got a text from Johnny Allan telling me that Gordon Hay had just seen a Rough-legged Buzzard over Mercer's West and Spynes Mere! 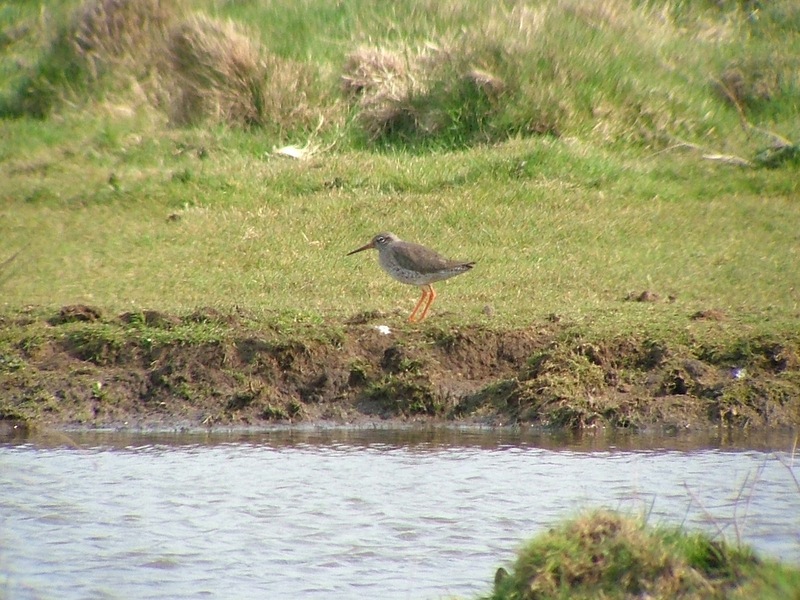 This was the first ever Rough-legged to be seen at Holmethorpe and it flew low right across the patch, heading south east, while I was trudging round the Moor. All very typical, but I wasn't that disappointed. It would have been worse if I had been on the patch but in an area like The Moors where I wouldn't have been able to see it – then I would have had a different reaction entirely. So, one that got away and one rediscovered. All in all, a typical birding day. The sun was even brighter and the air warmer today. And the female Lesser Spotted Woodpecker at Beddington had made an appearance mid-morning. With a quiet few hours on the work front expected, I took the opportunity to pay the Farm a visit. The Lesser Pecker favours some trees right in the west corner of the South Lake, along a strip of trees on the patch which is called Parkside (it's by the side of Beddington Park, funnily enough). I went over to the spot with another birder and peered through the trees and waited an age for a Lesser Spotted to appear. Nothing. Lesser spotted by name, it was certainly lesser spotted by nature. I was forced to give up so I walked back along the path and made my way to the exit. Before I did so, I decided to scan the mound behind the South Lake to see if any Wheatears were around but there wasn't a white-rumped critter in sight. So I scanned the trees just in case I saw the silhouette of the Lesser Pecker. And there it was. The Lesser Spotted Woodpecker (110) was perched on the trunk of one of trees. It was about a quarter-of-a-mile away so the views weren't that brilliant but I could see it through the scope. I went for my camera to take a record shot, then looked up to see it had gone. I trotted back to the strip of trees in case I could get a closer look, but it was nowhere to be seen. Two Peregrines circled overhead – good reason to keep a low profile, perhaps – and it didn't show again. Still, there's time yet before the leaves return to the trees with a flourish in the next couple of months to get a better view of this special little bird. I've looked on Facebook and can't see any message. I'll email you.